Gotta love that first flight pic with the birds wings in view! The title is wrong it should be “Old timey UCAV cameras” ’cause those little buggers are quite effective bombers! No, this was a pigeon bomber. Thanks for the link, that’s some crazy s##t! Had you published this yesterday I’d have never believed it. 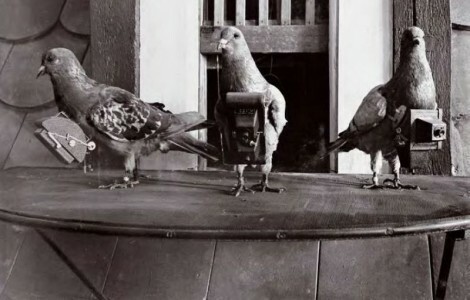 This is the other reason that during WW1, troops on both sides had strict orders to shoot down any pigeons they saw flying. How often they managed to shoot them down amazes me considering they were using rifles. >This makes us wonder if the birds are ever used in >modern drug running? Did they ever use parrots to get intel on pirates? No, but Hawks were used to intercept the pigeons. What are those birds thinking when the camera gets strapped on. Unfortunately the whole endeavour never revealed any significant information. A typical case of bad planning combined with skilled engineering.